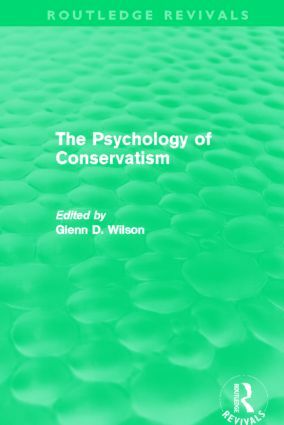 First published in 1973, The Psychology of Conservatism explores attitudes, their measurement, their structure and dynamics, and the personality traits apparently underlying attitude patterns. It examines the link between differing attitudes and discusses characteristic patterns and syndromes. The book focuses on the origins and dynamics of a major factor called "liberalism – conservatism" which is found to account for much of the variance in attitudes amongst different people. Contributors review previous studies relating to personality and attitude before engaging in new studies and proposing their own theories to explain the conservative attitude. The book introduces provocative theoretical ideas and provides a valuable examination of an important psychological and social attitude syndrome. This book will be of interest to researchers in personality and social psychology, sociology and political science and education.